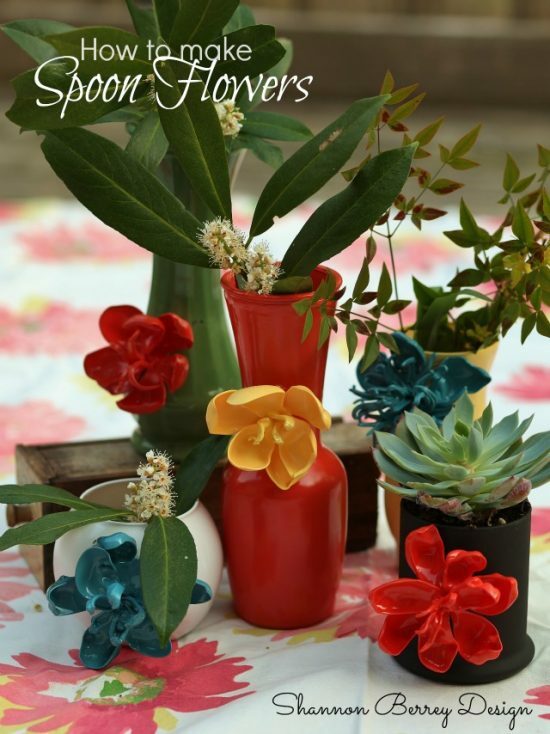 We’ve rounded up some of our favorite Plastic Spoon Craft Ideas and there is something for everyone. Check out all the ideas now and be sure to Pin your favorites. 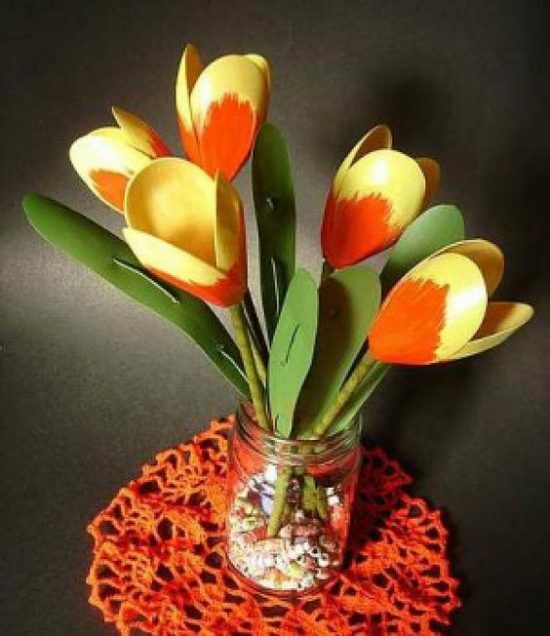 You’ll be surprised at what you can repurpose plastic spoons into and chances are that after you view this Plastic Spoon Craft Ideas post, you will never look at them the same way again. We’ve scoured Pinterest for the best and easiest projects and we know you are going to love what you see. Check them all out now. The first project that we are sharing with you is this gorgeous Plastic Spoon Mirror from Suzy’s Sitcom. This is a truly stunning piece and the spoons create a wonderful texture. Here’s what you need. 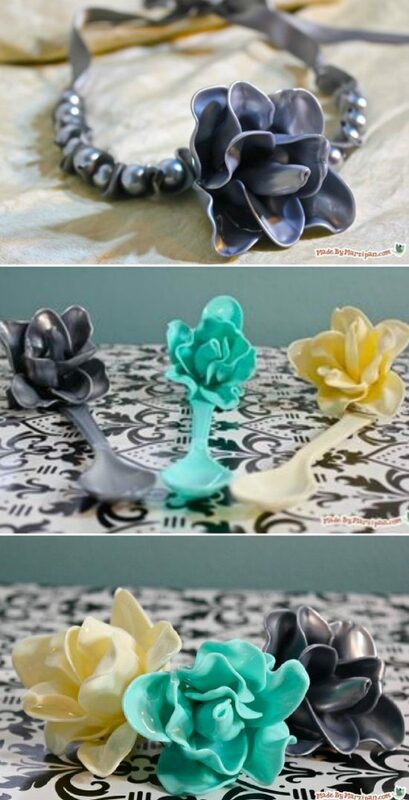 As you can see above, these gorgeous Spoon Roses can be used for any number of things. The creator has used them as a bracelet and also for hair clips. They could be rings and necklaces too. Found out how to DIY on Craftberrybush. This rose was made using – you guessed it! – plastic spoons and one magic tool, a candle! EVEnl on Cut Out + Keep came up with this beautiful way to make a statement necklace or brooch. You’ll use 17 spoons in total, melting them slowly over the candle. You’ll then shape them by hand by twisting and pulling them into the desired shape. You’ll then assemble the petals and get rid of most of the handle on each spoon. Get the full tutorial on Cut Out + Keep. 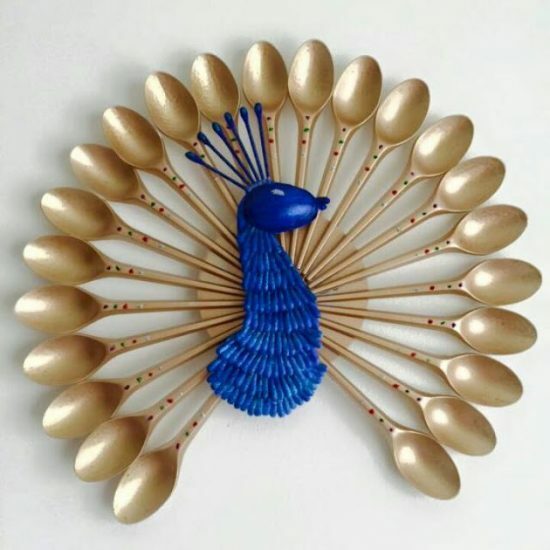 We love the idea of using all of these different types of plastic spoons – regular and those tiny cocktail ones – to make a peacock. It would make a beautiful wall hanging in the kitchen and could even be a great craft to do with the kids. See the photo tutorial at Crazzy Craft. This beautiful tea light candle holder comes from blog PetiteCandela and looks so pretty with a little tealight candle inside! It’s easy to make using a candle holder and gluing on the plastic spoon tops one at a time.You can choose to spray paint the spoons as they did or leave them plain white. Either way, they look beautiful, especially when lit up! See how they put it together at PetiteCandela. This video from Curious shows you how to put together this lovely garden decoration. 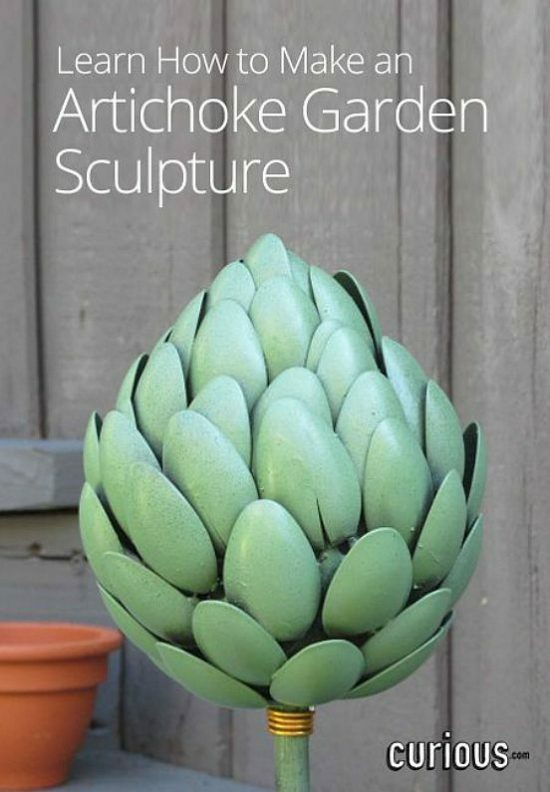 We think it would look beautiful surrounding a garden, placed on a deck or even in between pots. It could even make a nice addition to a fairy garden. To see the tutorial, head over to Curious. 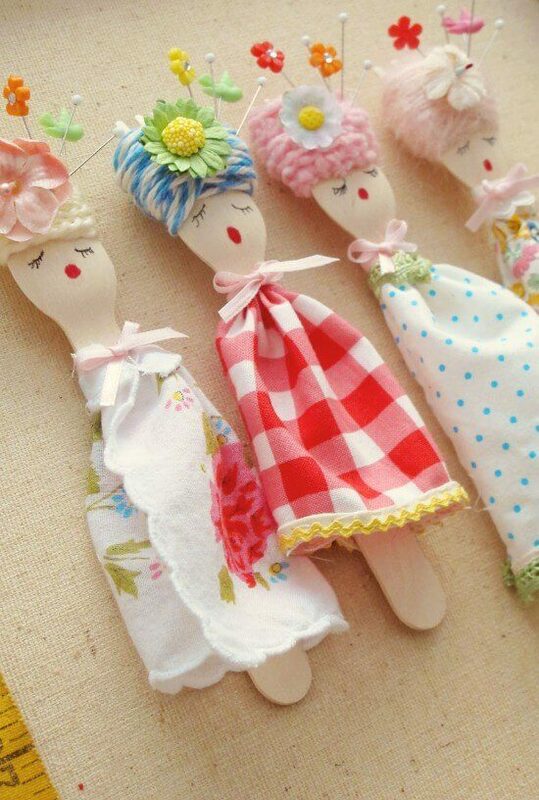 Aren’t these plastic spoon dolls made by Inspire Co. just adorable? We love the idea of using them as kids room decor or even hanging them up in the kitchen. You can wrap the tops of the spoons in yarn or twine, add some small decorations, then decorate the bottom with a fabric scrap “dress”. Faces can be drawn on and the added bowtie is a nice touch! See her post about this craft on Inspire Co.
Wouldn’t you love to walk into your home and see one of these gorgeous mirrors hanging on your wall? They can be made in any color you’d like and are surprisingly budget-wise to put together. Kristi from Addicted2decorating came up with the idea for this craft, which uses the tops of the spoon to make the decor around the mirror, and the bottom handles of the spoons to hold two wreath forms together. It’s a genius way to use up old spoons and with all the customization options, one of these could be so fun to make! Get the full tutorial from Addicted2decorating. Making a gorgeous Water Lily from plastic spoons is actually quite simple and a lot of fun. In the photos above, an old plastic egg carton is used to make the center of the flower. You can find a similar video tutorial on Youtube from Crafty Cheli. See the Youtube tutorial by Crafty Cheli. 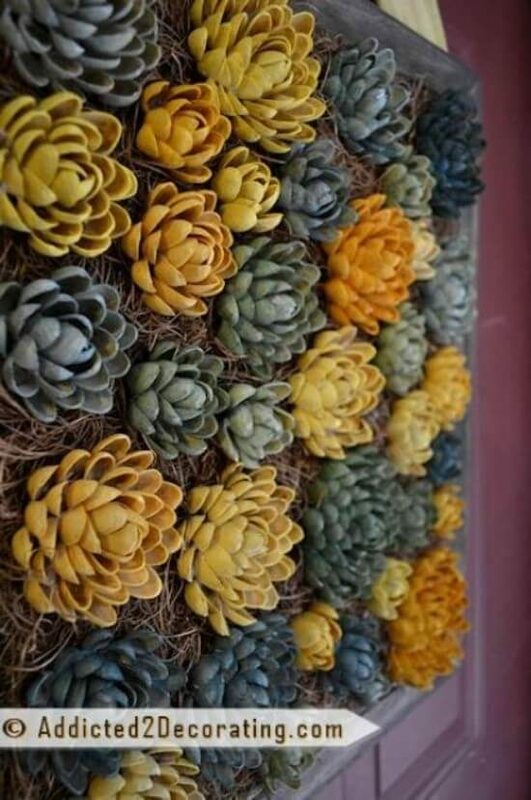 This idea from Addicted2decorating is a beautiful wall hanging that looks like a lovely garden of succulents. But actually, those “plants” are made from pistachio shells! 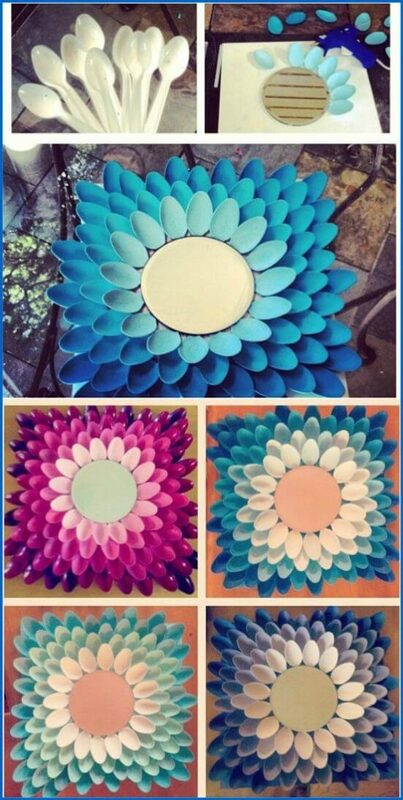 You could make the same thing using plastic spoons, however, using some of the tutorials we’ve included above to make a similar looking wall hanging. See the tutorial from Addicted2decorating. 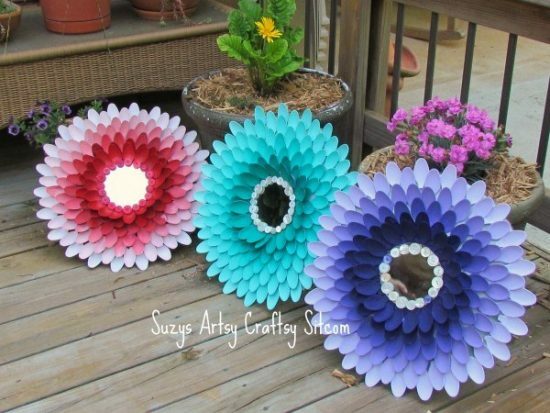 These lovely blooms are actually made out of a ton of recycled bits! Teresa Wong from TheStar made these using plastic spoons for the flower petals, chopsticks for the stems and even strips of soda bottle plastic to make the leaves. You can see the full tutorial at TheStar. Club Chica Circle made this lovely flower garland, using plastic spoons for the petals. In this tutorial, she also gives a great method for easily cutting the spoon handles off by heating up a regular knife. 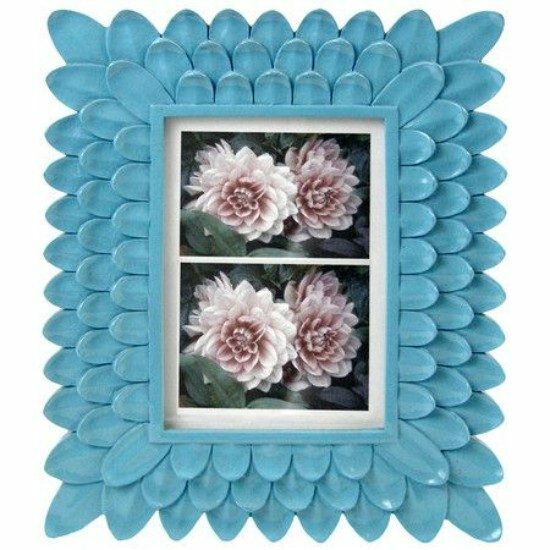 The wooden triangle panels are painted bright to match the flowers, but of course, they can be any color you’d like. This would be a lovely decoration for a party, especially in the spring! This lovely frame used to be sold by Joss & Main but could actually easily be replicated using plastic spoons over a photo frame. You could even melt the spoons and shape them ahead of time using the methods we’ve outlined on this page in several tutorials. 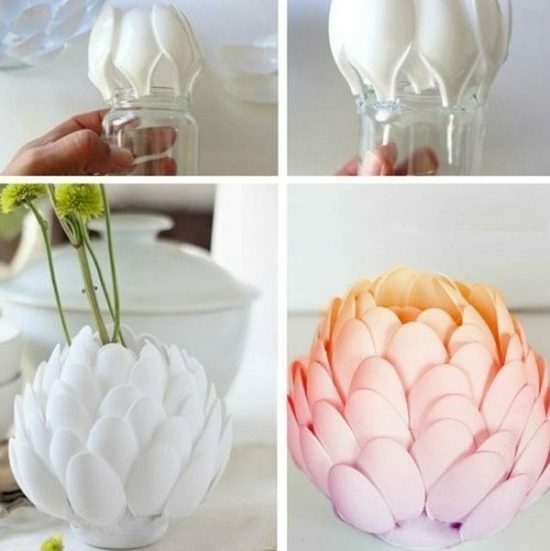 Shannon Berry came up with these gorgeous blooms made from melting the tops of plastic spoons. She used a candle to melt them, much like the other tutorials on this page. She, however, did say that if they spoons turn a little black it’s alright, her spoons did too and paint covers it all up. You can see how she did it all on her blog. See this tutorial at Shannon Berry Designs. We just love these little ladybugs from this blog. 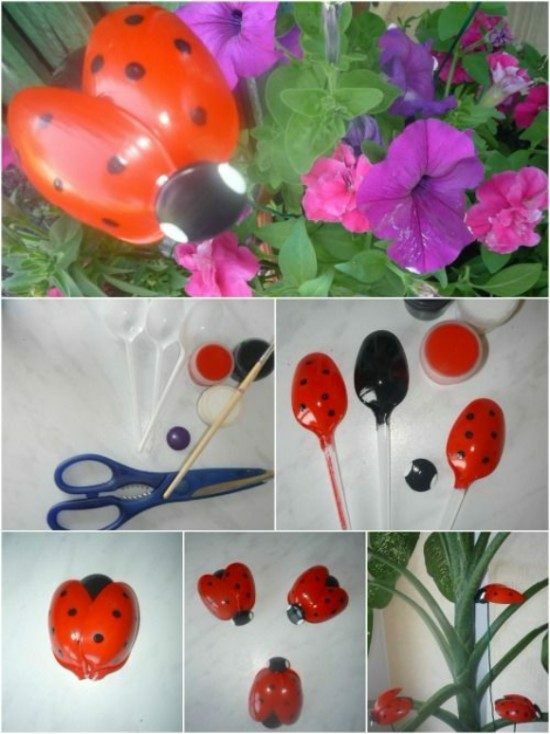 These ladybugs could even be used as an extra decoration for one of your plastic spoon flower projects. They would also make really nice garden decorations. You can watch a similar tutorial on Youtube by RecycledBottleCrafts. See the Youtube tutorial here or the blog post here. 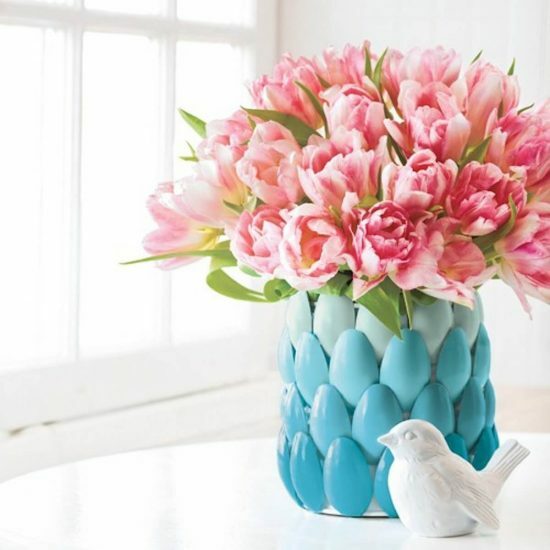 AllYou shows you how to turn a regular vase into this gorgeous stunner using only plastic spoons and a glue gun. You can paint the spoons any color you’d like, and really have a lot of fun with different shaped vases, jars or even cups. See the full tutorial from AllYou. This lovely candle holder idea from glue Dots uses a fabric flower along with plastic spoon tops to make a lovely project! The plastic spoons keep the fabric safe and allow you to structure the flower however you’d like. See the tutorial from the Glue Dots Blog. 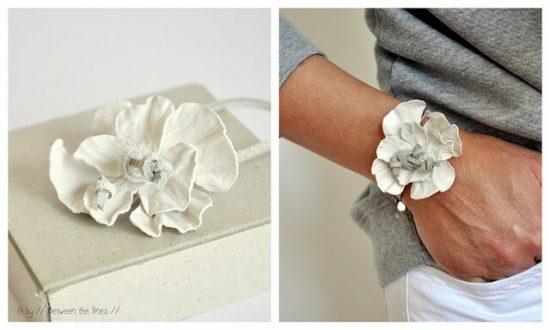 The flower in the bracelet above was made by the PM Between The Lines blogger using leather. 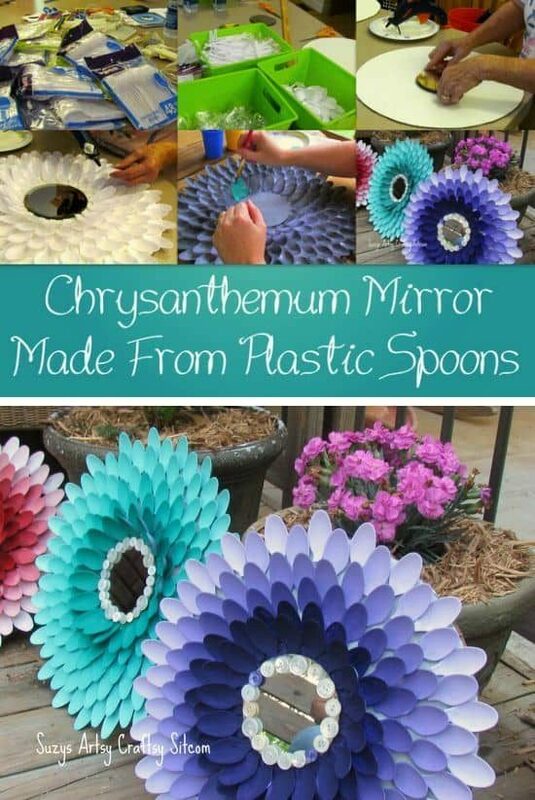 But you could use any of the flower tutorials above to make a really nice similar project with plastic spoons. The possibilities are really endless with these projects! See the full post here at Pm-BetweenTheLines.